Light Works (2018) – 34:07 loop, silent This work was conceived as a contemplative and evolving chromatic animation. 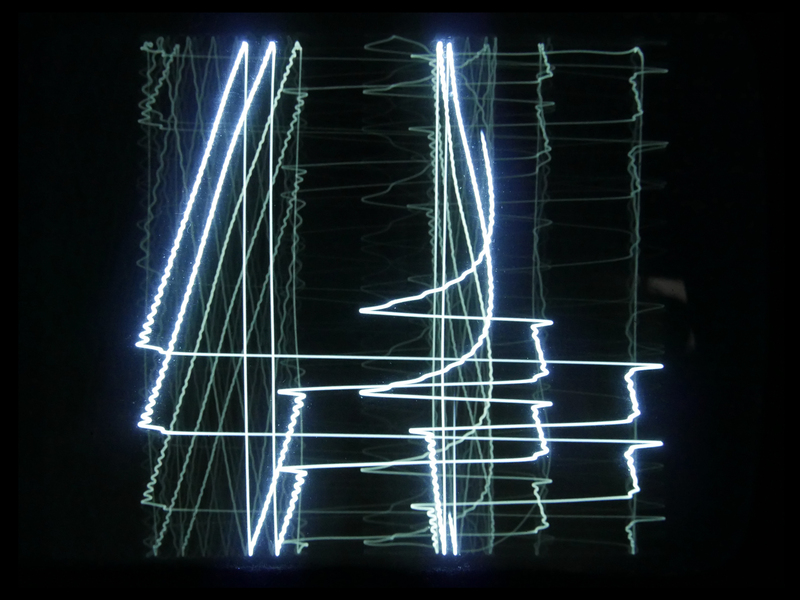 Analog video and sound synthesis both use voltage interactions to evolve dynamic patterns, whether finally reproduced as video or sound. In the Light Works vivid hues and patterns emerged as oscillations interacted in an LZX Visual Cortex video synthesis module. 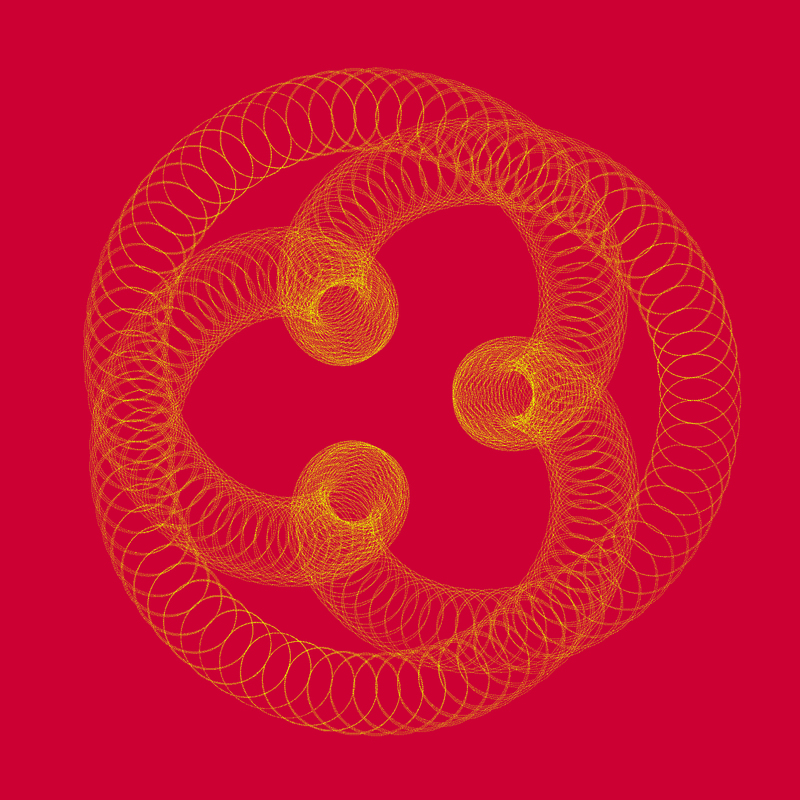 The artist was there to coax and capture these serendipitous interactions of form and chroma. 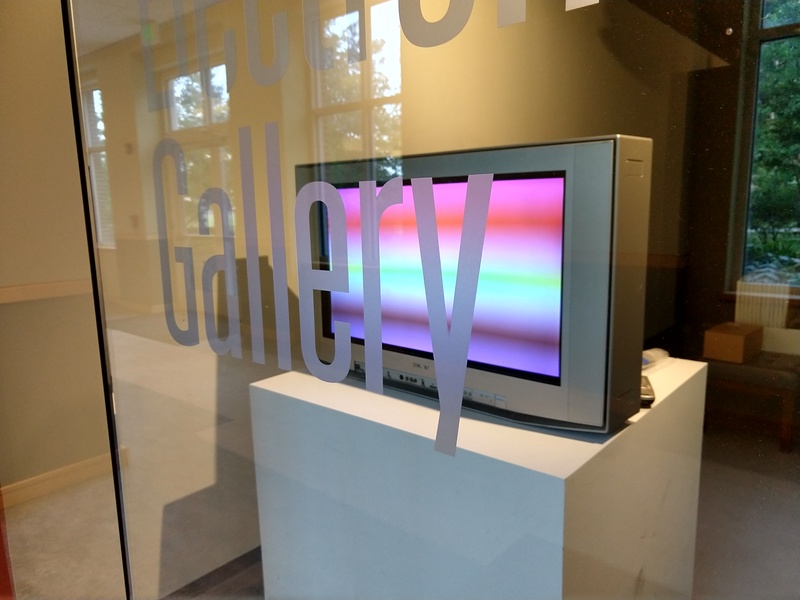 Installed in the Electronic Gallery, Salisbury University, July 16 - October 25, 2018. Bell Labs Mosh (2018), total running time 05:12. Part of a video series that examines the early information age, this industrial film was produced at Bell Labs and represents early experiments in rendering human speech and the "Poem Fields" computer animation work of Stan Vanderbeek and Kenneth Knowlton. Many of the inventions predicted within this video area a reality and commonplace, as accessible as our mobile phone. The original industrial film was made available under Creative Commons license, at archive.org. Entr’acte-Interact (2017) interactive HD video synthesis system triggered by a microphone and two infrared sensors, stimulating a drum machine and animation system. Installed at the Kohl Gallery, Washington College, November 9 - December 15, 2017. Silent excerpt from CosmonautOp (2016). The original features a music score and is 20:00 minutes in duration. Analog video and sound synthesis both use voltage interactions to evolve dynamic patterns, whether finally reproduced as video or sound. In the Light Works vivid hues and patterns emerged as oscillations interacted in an LZX Visual Cortex video synthesis module. The artist was there to coax and capture these serendipitous interactions of form and chroma. 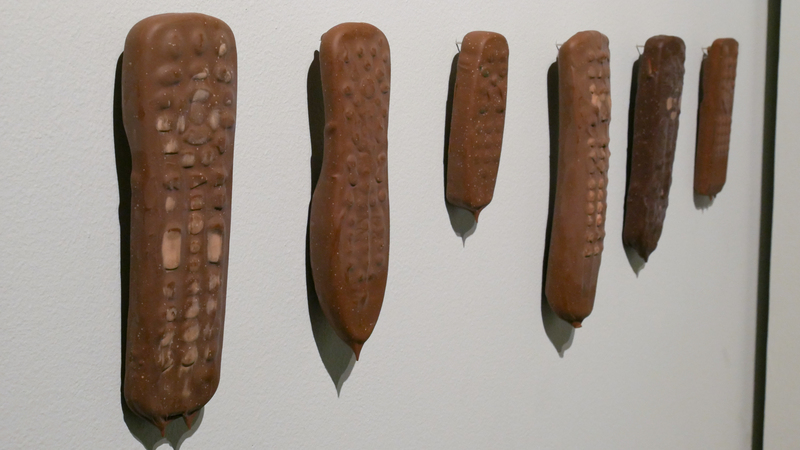 Installed in the Electronic Gallery, Salisbury University, July 16 - October 25, 2018. 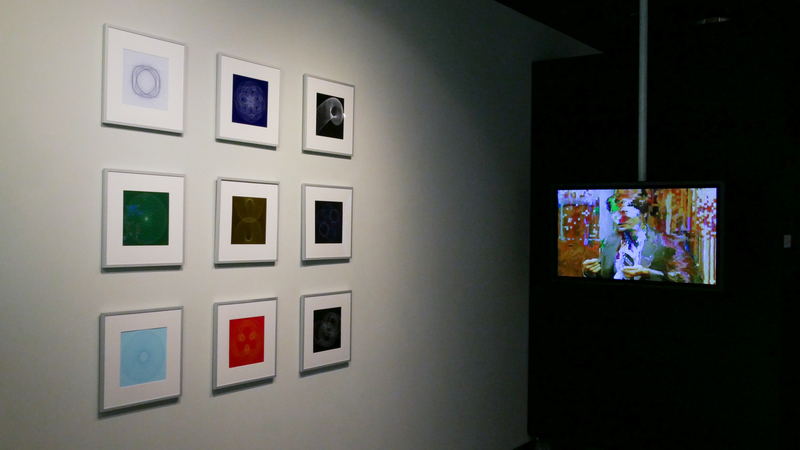 An installation view of Light Works at the Electronic Gallery, Salisbury University. 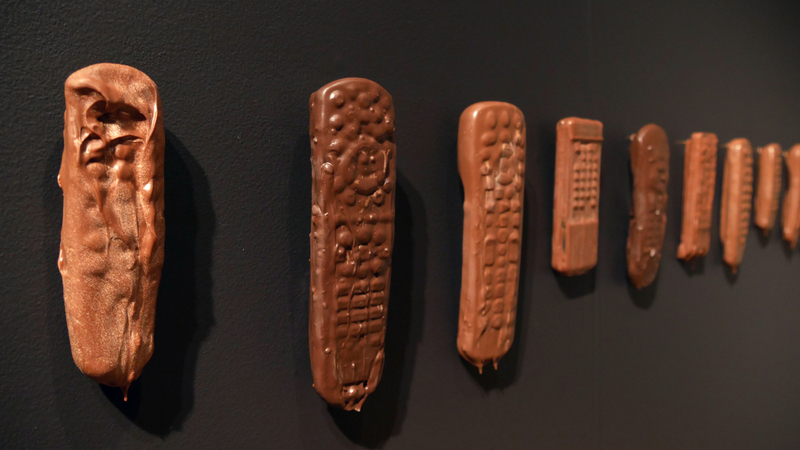 Exhibition on view July 16 – October 25, 2018. Bell Labs Mosh (2018), total running time 05:12. 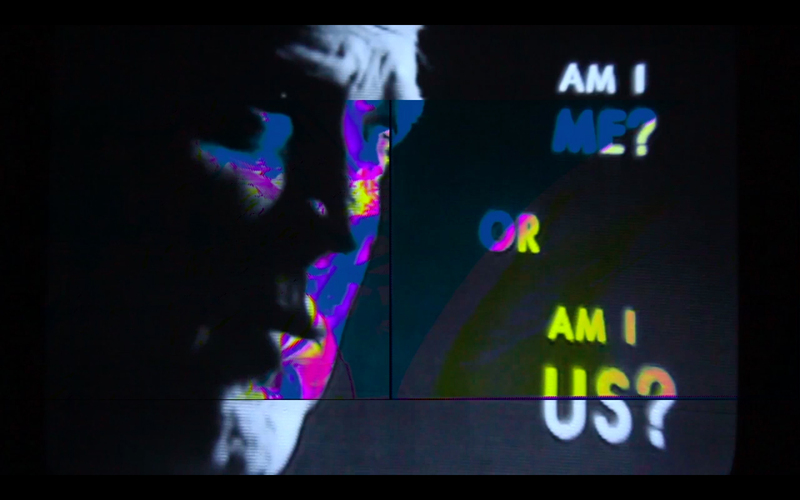 Part of a video series that examines the early information age, this industrial film was produced at Bell Labs and represents early experiments in rendering human speech and the "Poem Fields" computer animation work of Stan Vanderbeek and Kenneth Knowlton. Many of the inventions predicted within this video area a reality and commonplace, as accessible as our mobile phone. The original industrial film was made available under Creative Commons license, at archive.org. 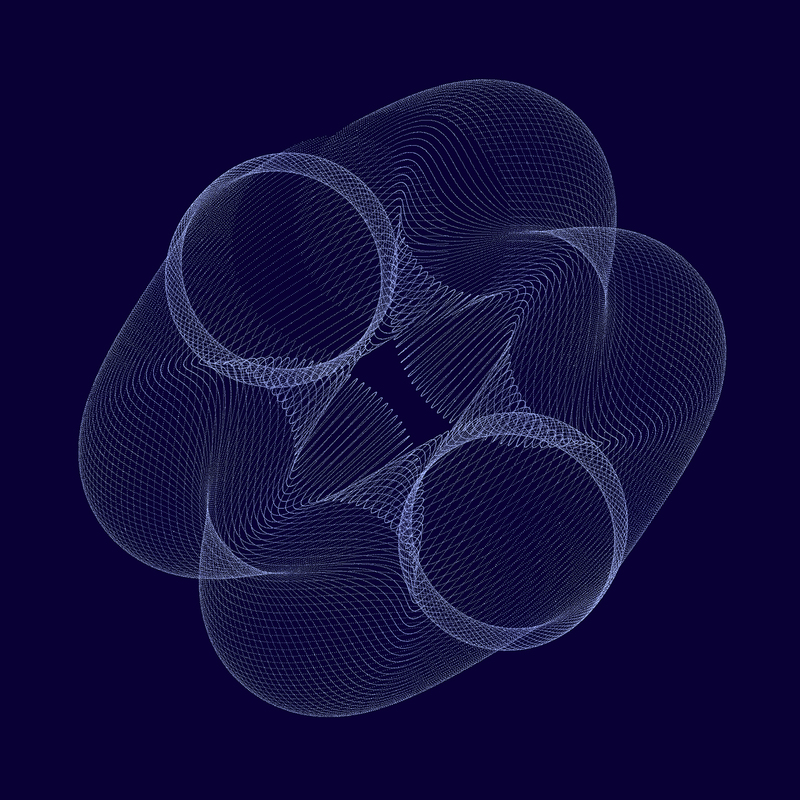 This data-moshing work was created while in residence at Signal Culture, Owego, NY. 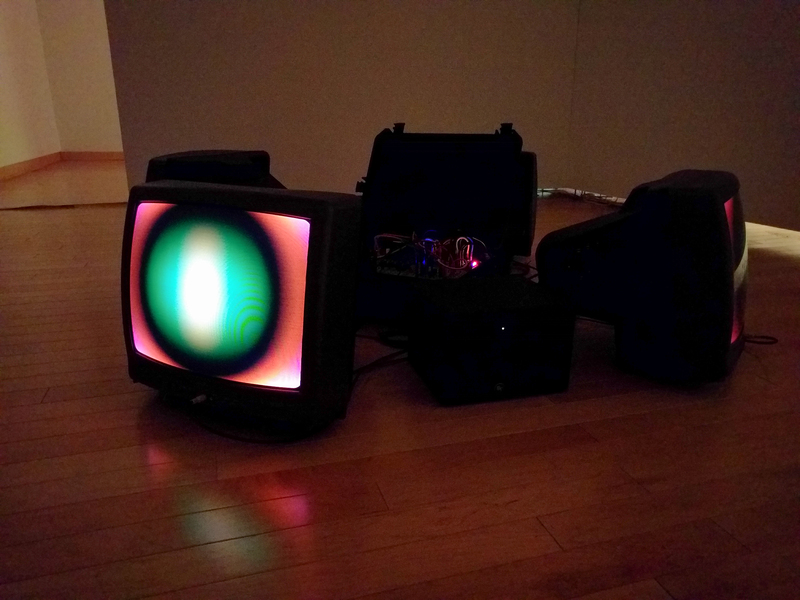 Paik/Abe Wobbulator abstractions produced at Signal Culture, Owego, NY and exhibited in Voltage is Signal, my solo exhibition at the Electronic Gallery, Salisbury University, July 16 - October 25, 2018. 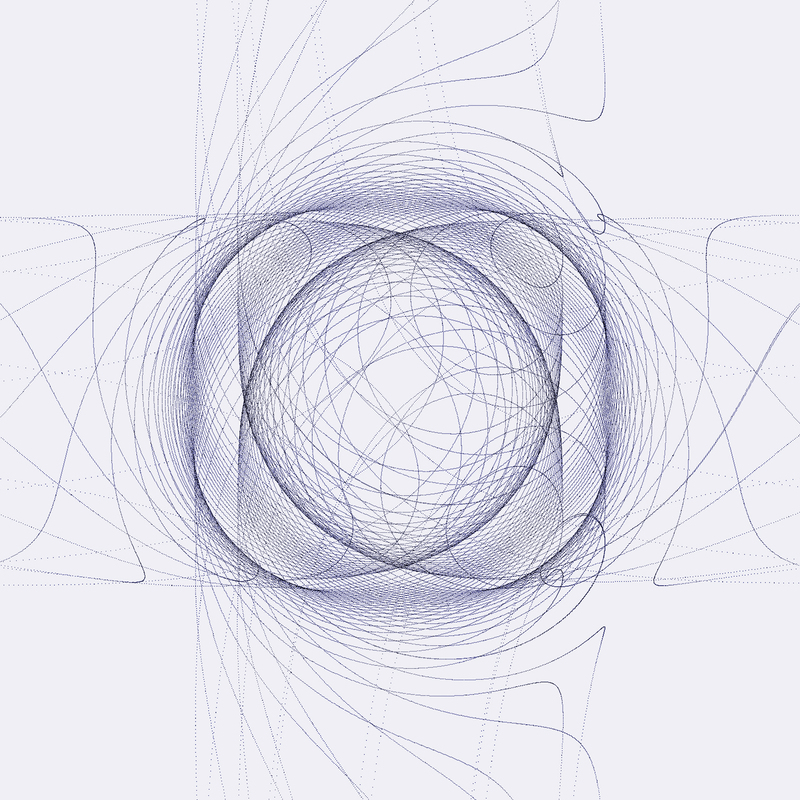 Subtle Oscillations (2018), permanent pigment prints, 12x12 framed works, 9 presented in a grid, oscillation of waveforms produce varied harmonic patterns. 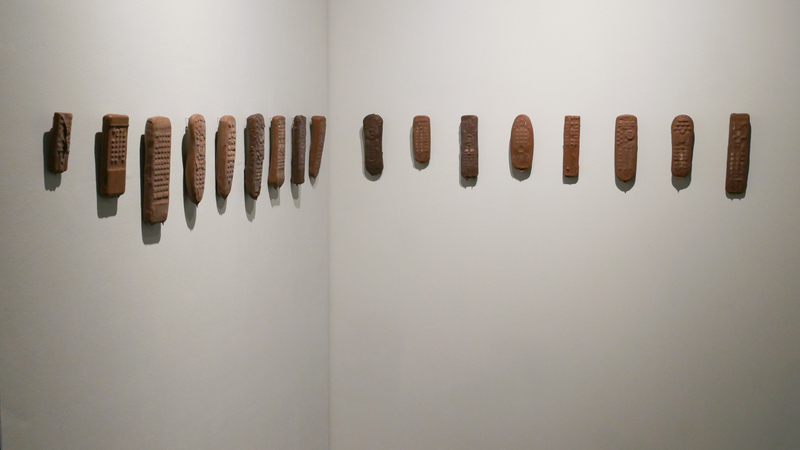 Installation view, Subtle Oscillations prints,Electronic Gallery, Salisbury University, July 16 - October 25, 2018. Light Well for James Turrell (2017), employed analog video and sound synthesis to evolve in real-time dynamic and shifting sound and light patterns that immersed a room in vivid hues. 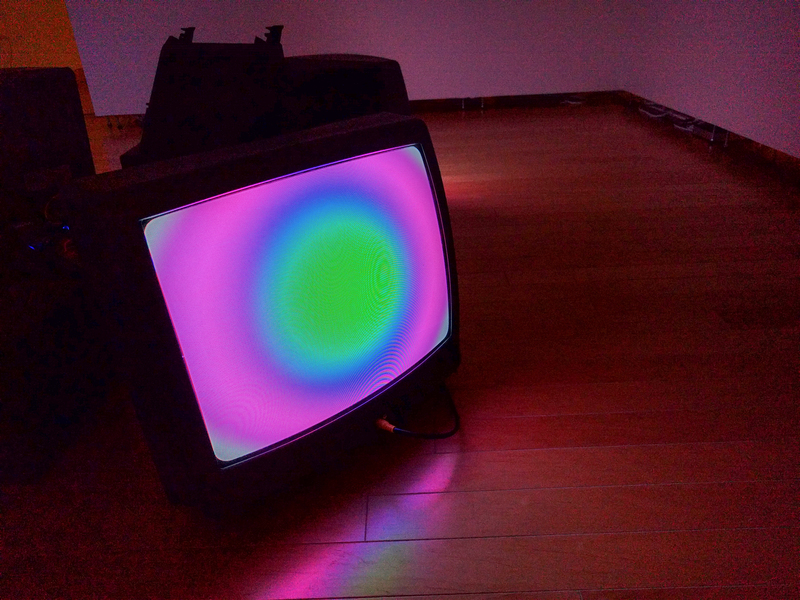 Four analog CRT tv monitors screened opening and closing concentric circles of deeply saturated color. 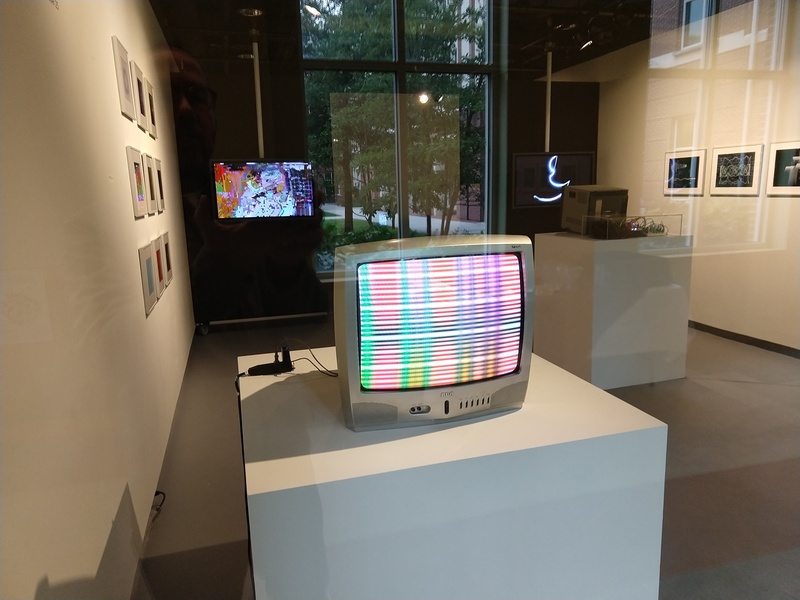 Installed at the Kohl Gallery at Washington College with four matched CRTs, November 9 - December 15, 2017. 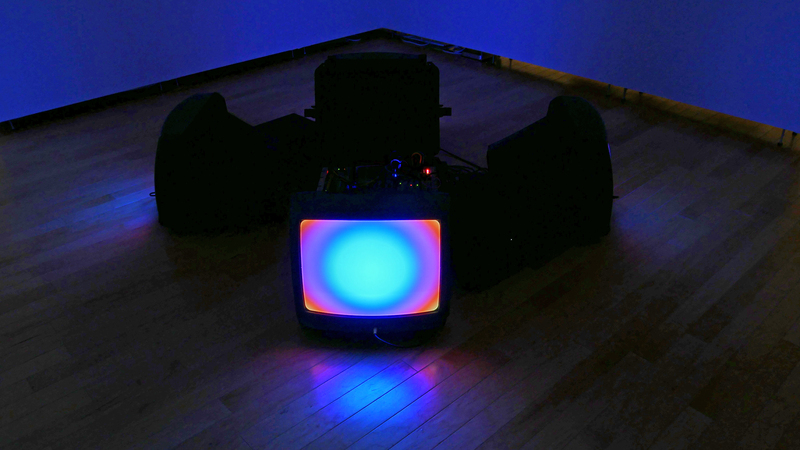 Installation view of one of four CRT analog video monitors. 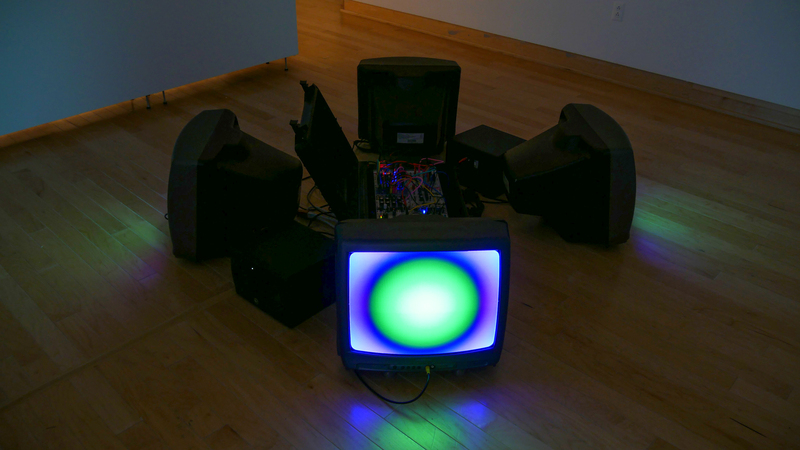 View of four CRT analog video monitors, analog modular audio and video synthesizer, powered audio speakers reproducing the audio patch. View from above of the discrete space where the system was installed. Video color transforms over a long time cycle, mixing chroma and value to a central "well." 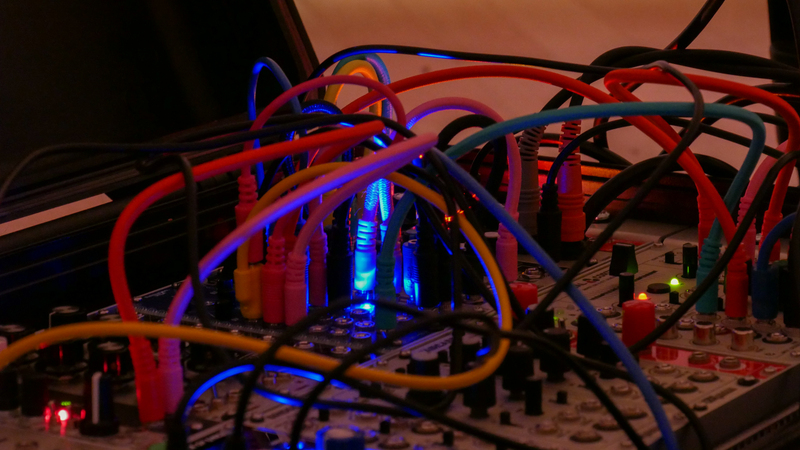 Close up of the analog modular sound and video synthesizer patch cable network. Excerpt of Light Well for James Turrell (2017), analog video and sound synthesis. Installed at the Kohl Gallery at Washington College with four matched CRTs, November 9 - December 15, 2017. Entr’acte-Interact (2017), interactive HD video synthesis system triggered by audience members improvising with a microphone and two infrared sensors that triggered a drum machine. The installation featured a drum machine, animation system and stereo speakers. 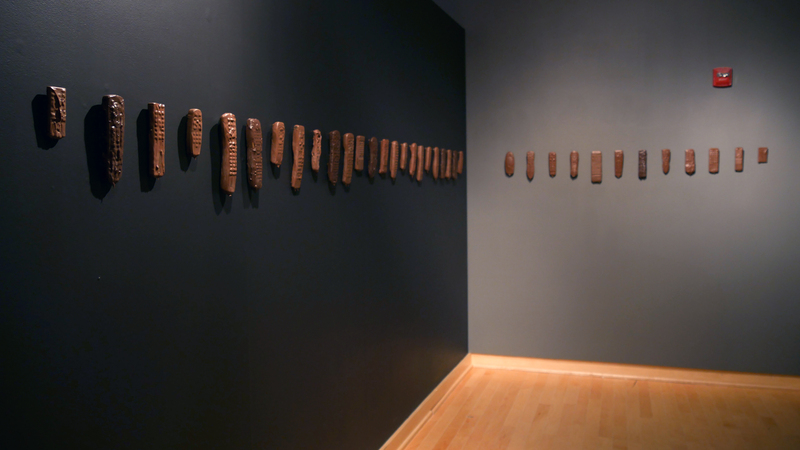 Installed at the Kohl Gallery, Washington College, November 9 - December 15, 2017. Twelve Electron Drawings (2017), permanent pigment prints, 16 x 20. 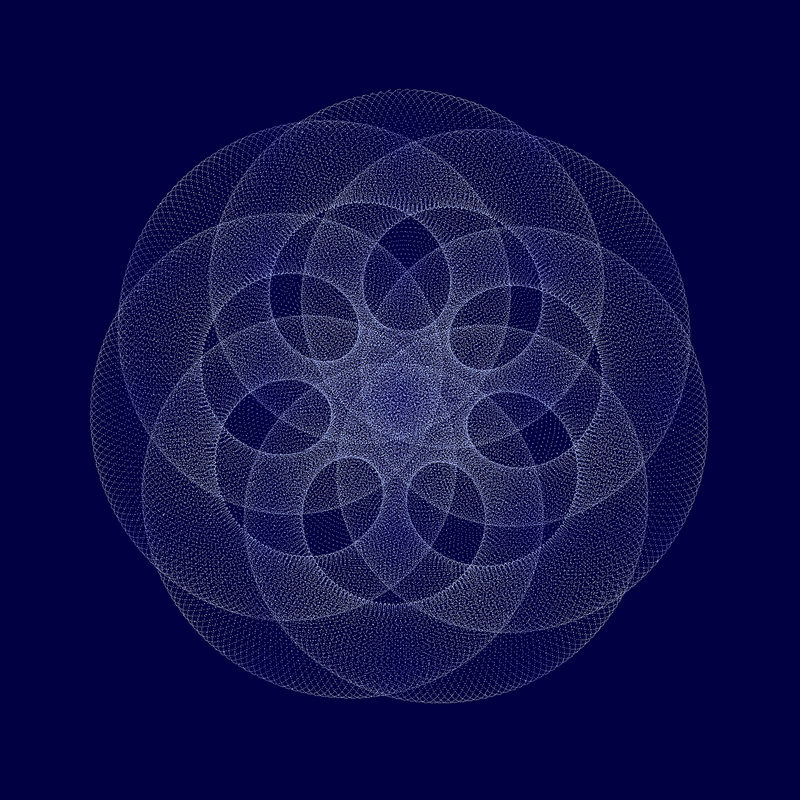 These images were produced using an analog modular synthesizer and hacked Vectrex game system. 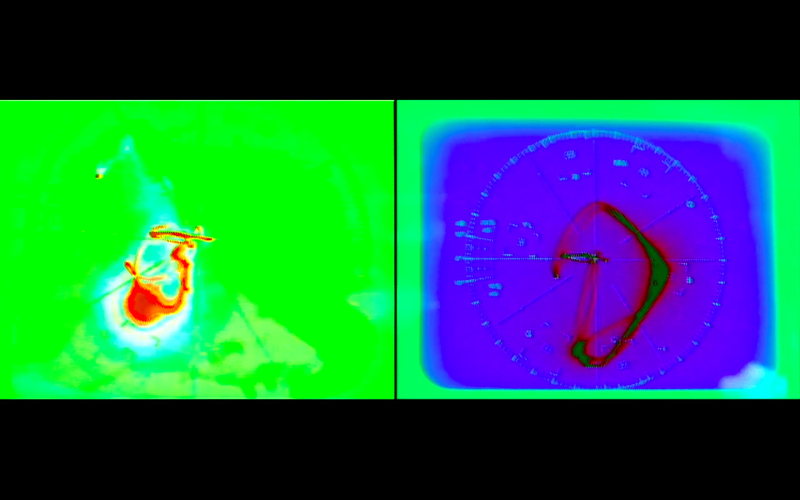 Images were "drawn" in real time by voltages interacting in the modular synth, and then photographed direct from the monitor. A series of 12 images was installed at Washington College's Kohl Gallery, exhibition dates November 9 - December 15, 2017. Installation view at Kohl Gallery of framed Electron Drawing prints. 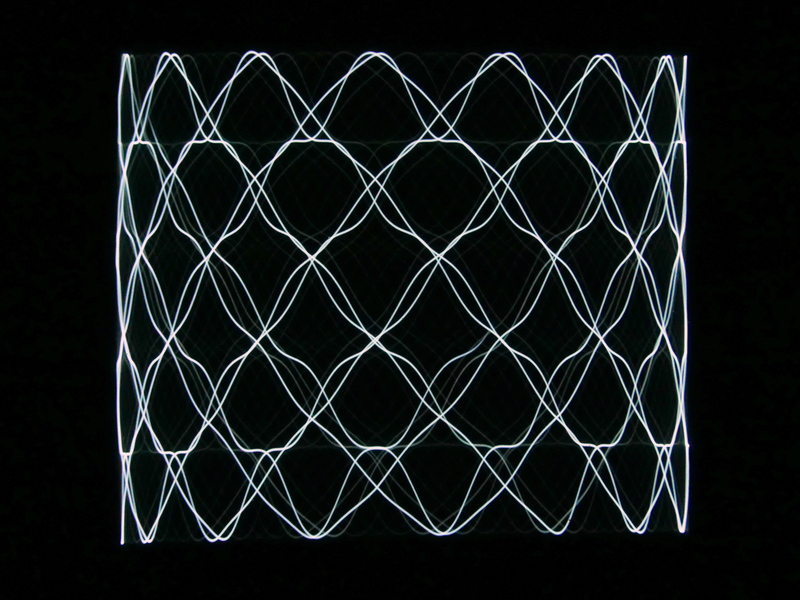 These "electron drawings" are produced when analog voltages interact through the oscillators and filters of a modular synthesizer. The synth can produce audio tones, but it can also produce live visual material when sent to the hacked Vectrex game console, which acts as a kind of oscilloscope for the system. A still camera is then used to snap the evolving drawings, freezing them in an instant. The patched modular synthesizer, which produces the voltages that draw forms for the "electron drawings. 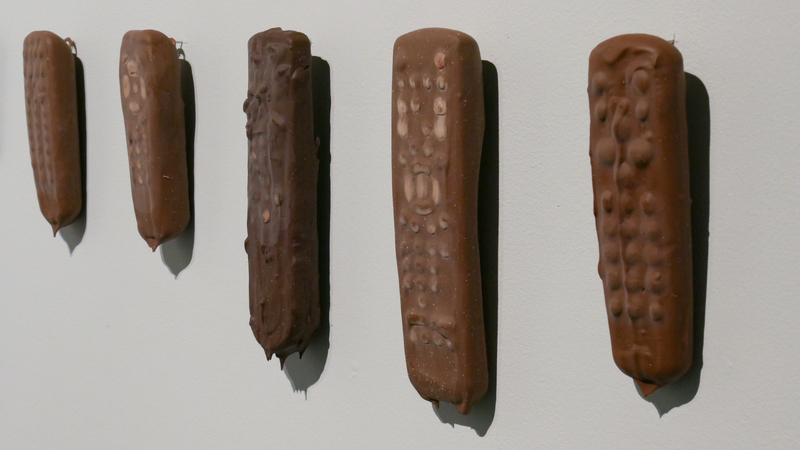 36 television remote controls dipping in chocolate, included in Voltage is Signal: Analog Video Works by Timothy Nohe, Kohl Gallery, Washington College, November 9 - December 15, 2017, and, the Electronic Gallery at SalisburyUniversity, July 16 - October 25, 2018. 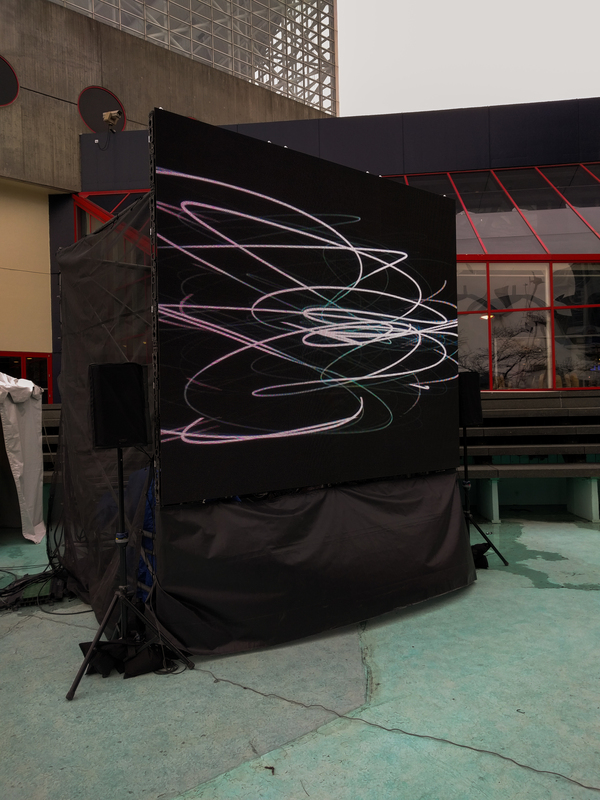 Electron Drawing – Visual Music was installed at Light City as a public art commission on the Art Walk. The piece employed analog modular synthesis sound which simultaneously produced live vector graphic video that was captured by a HD camera fed directly to a 12’ by 9’ LED jumbotron wall. 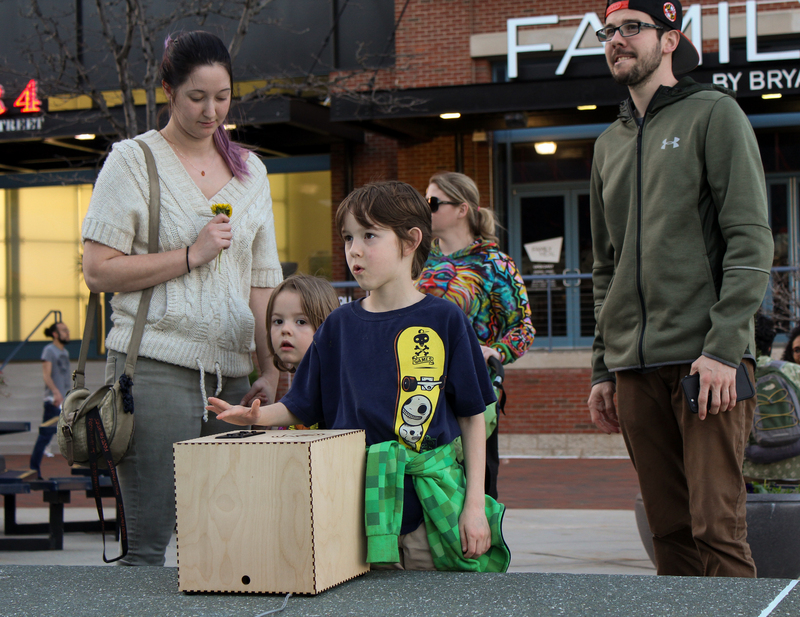 Audience members shaped the sound and the drawings through two motion infrared motion sensors, and these were inset into two custom lasercut boxes produced by the artist. 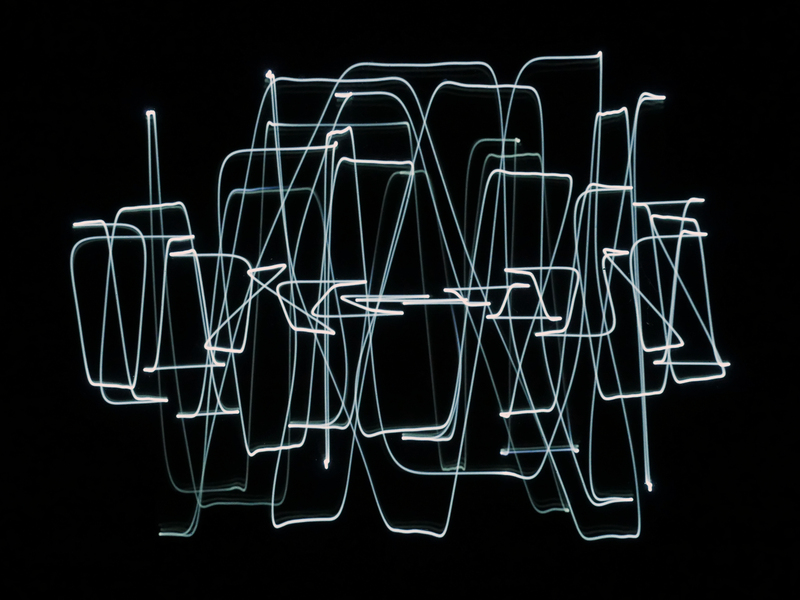 Documentation of Electron Drawing - Visual Music, installed at Light City Baltimore, Maryland, USA. March 30 - April 8, 2017. Analog modular synthesizer, two wireless infrared sensors in lasercut interfaces, vintage hacked Vectrex game machine, HD camera, stereo PA system and LED wall. 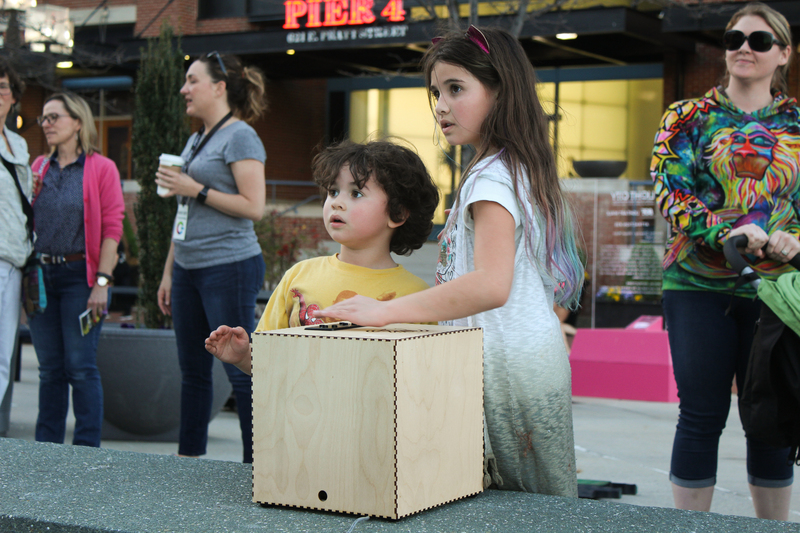 View of the LED Wall "Jumbotron"
Kids interacting with the wireless infrared sensors to shape the sound and drawings. 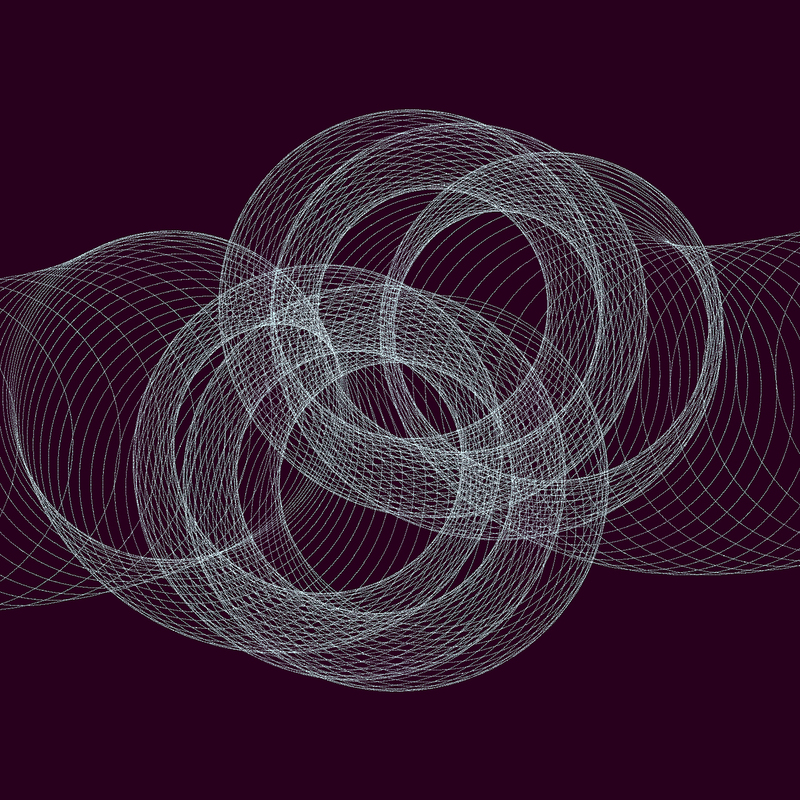 Shaping sound and drawings in real time with a touchless interface. 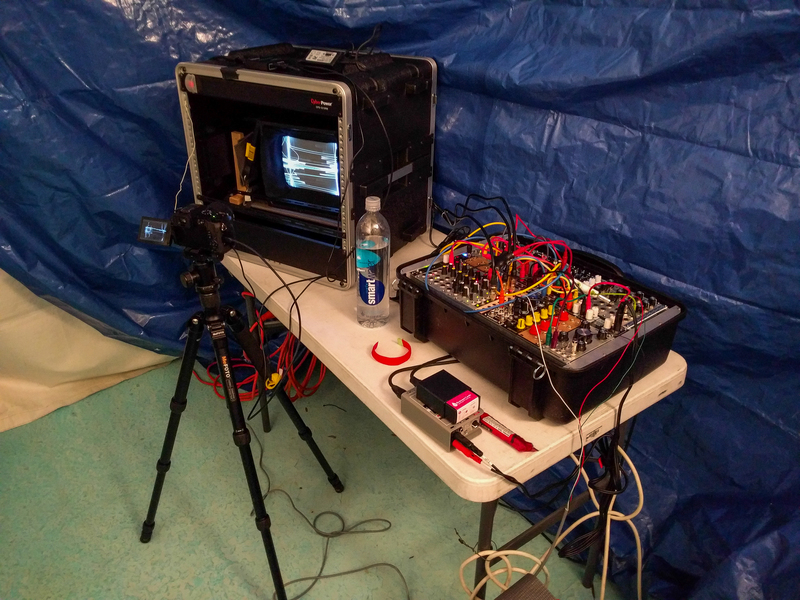 Behind the scenes at Light City, this view shows the synth, camera and Vectrex game console that displayed the live "electron drawings"
Evolving drawing captured from screen of the Vectrex. 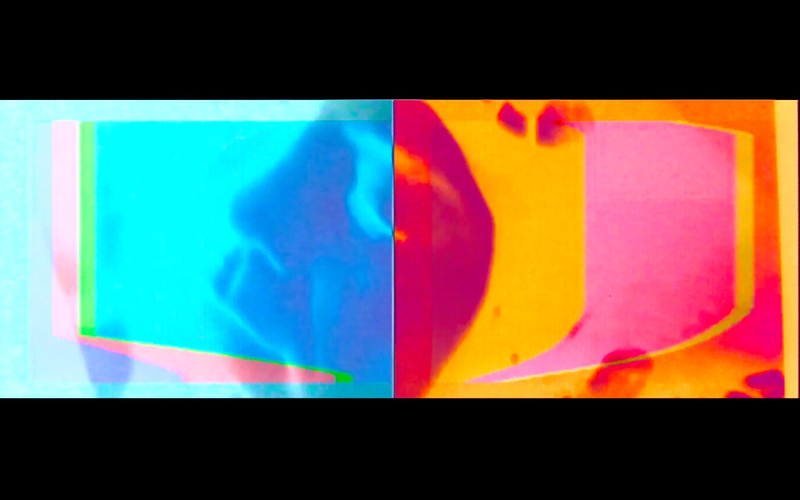 Analog video synthesis and found footage digitally composited with Rutt/Etra Video Synthesizer analog raster manipulation, and Paik/Abe Wobbulator transformations. 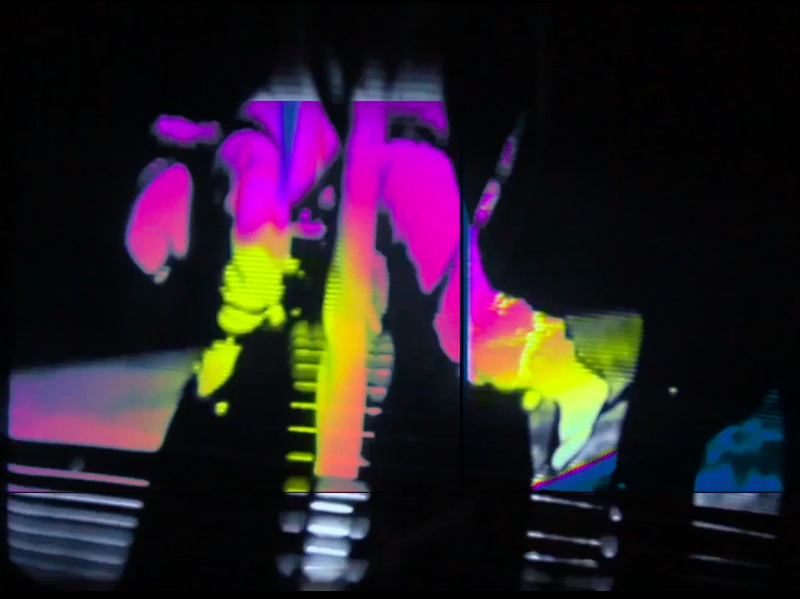 Video produced while in residence at Signal Culture, Owego, NY. Architectural Video Screen at Wall Academic Center, Van Every Smith Galleries at Davidson College, Davidson, NC, November 15, 2018 - February 6, 2019. Livewire 9, UMBC, October 27 - 28, 2018, concert interstitial video, Earl and Darielle Linehan Concert Hall. The Agency of Art: Visual Arts @ 50, University Art Gallery, Mandeville Center, Univerity of California San Diego, April 12 – May 17, 2018. Vigil, Maryland Institute College of Art, Baltimore, April 30 and Worlds in Collusion at Artscape 2016. 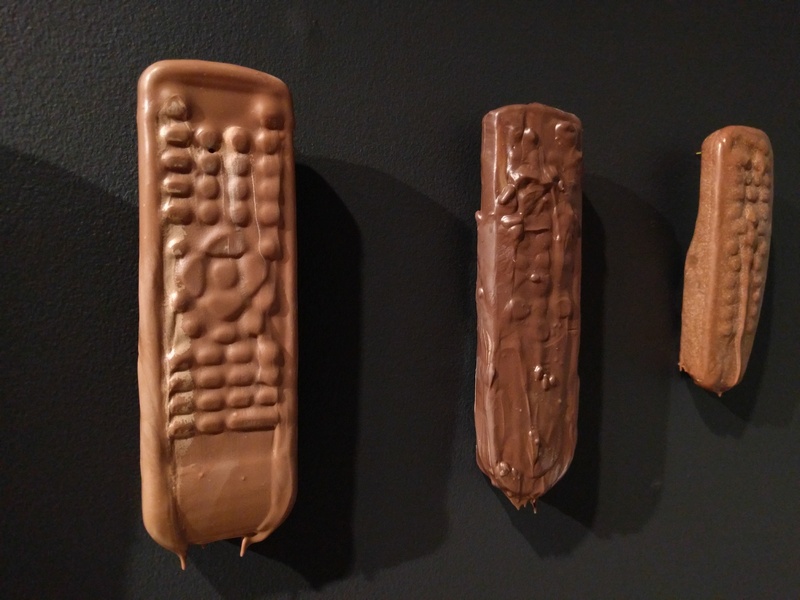 Electronic Gallery, Salisbury University, July 16 - October 25, 2018. Kohl Gallery, Washington College, November 9 - December 15, 2017. 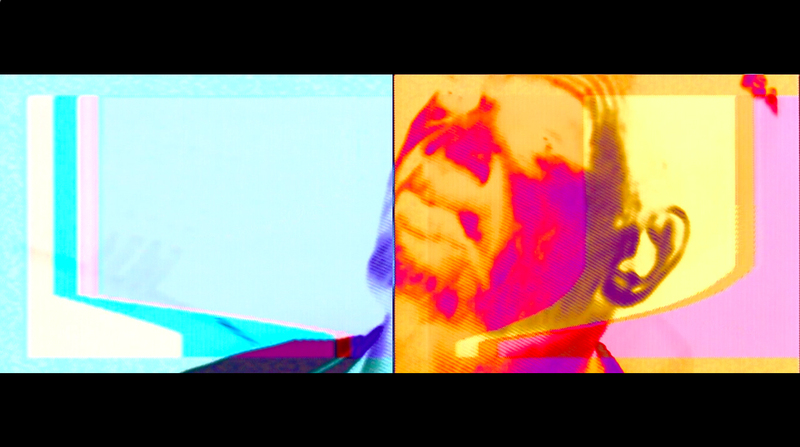 Color, TRT 20:00 with original sound score by the artist. Analog video synthesis with digital compositing. Scaled to HD video, 720P.